Gata Gorda Ediciones is a Chilean children's literature publishing house dedicated specifically to edit and publish picture books and illustrated books. Despite its short existence (under 3 years) and their brief catalog (four titles to date), Gata Gorda Ediciones has established itself as a publisher with a recognized brand with good presence in bookstores, with a loyal following (just look at the number of active followers we have on social networks) and, according to specialists in the area, with a promising future. 1. 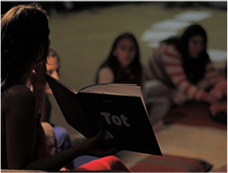 Guadalajara Book Fair: Tot, its first title, which had just been published, was selected to be part of the publishing catalog Chile exhibited at the Guadalajara International Book Fair 2012, where the country was the guest of honor. 2. Awards: the same title was selected for the White Ravens 2013 list of the International Youth Library in Munich (http://bit.ly/ZWggPn). Note that this distinction is one of the most relevant internationally to this editorial segment and the Youth Library in Munichis recognized as the library of the world's largest children's and youth literature. Further, the author, Dominique Schwarzhaupt, was awarded with the Colibrí Medal, Child Fiction Category, as best illustrator in 2013, by the national office of the IBBY (http://www.ibbychile.cl/joomla16/). 3. Bologna Book Fair: as a result of the foregoing, this book was exhibited at the fair stand of that library on the Bologna Book Fair, the most important for this segment internationally. 4. Second Edition: in June 2013, before it happened a year since its release, it was necessary to take out a second edition of this title, which is really unusual in the Chilean publishing market (92.6% of Chilean books do not get reissued). 5. Coeditions: since November 2012 Gata Gorda Ediciones and the English subsidiary of transnational Simon & Schuster have been working together coediting two books (¡Bigotes! and El niño y el aeroplano). For the future, we will continue this join venture with more publications. 6. Our latest book, Mi lista de envidias (My list of envies), by Irene Bostelmann and Catalina Silva, is a precious picture book, which has already been awarded by its illustrations: in 2012 won the AI-AP Latin American Illustration in New York, and in 2011 was selected finalist of the 4th CJ Picture Book Award in South Korea.